You'll need to click through and view the original on Flickr to read the packets. It's that time of the year again and once more the deadly sin of greed has overwhelmed any good sense I might have had about taking on too much or wasting money on long shots. 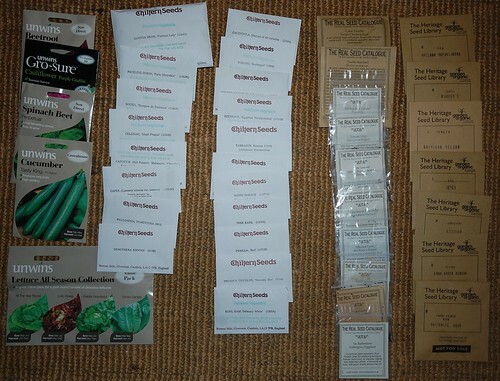 As well as some Unwins seeds which were in my xmas stocking I've indulged in orders with Chiltern Seeds, Realseeds and the HSL. I rather fear that this may not be the last of it. Anyway, along with some things that I've saved in the past but allowed to lapse, some hopeless recurring failures that I'm going to try one more time, Capers and Perilla please step forward, and a selection of chillies for the greenhouse there are a few oddities which I'm trying as part of the usual experimentation. Oenothera Biennis is something I've been coddling along from a chance weed plant that popped up in Newport Pagnell. I was hoping to collect enough seed to try for a row in the vegetable patch so that the roots could be assessed for the kitchen but I've only managed to keep one saved seedling going in France which didn't flower last year as I hoped (they're biennial, just like it says on the packet but this one seems to want another year) so I've bought some seed in to avoid wasting any more time. There are any number of odd salad leaves around, I'm very tempted by Salsola, also known as Agretti, but the cost of the seeds is prohibitive so I've put that on hold and instead decided to try Buckshorn Plantain because you can never have too many edible weeds in a garden. I've also got some Edible Chrysanthemum. I have grown this before but never really got to grips with cooking it, so it's worth another go and if I don't like it the flowers are very pretty and brighten up the vegetable patch nicely.